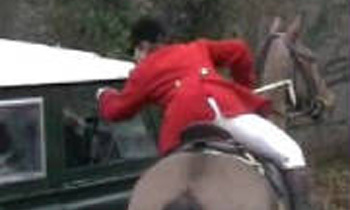 Protect Our Wild Animals has today been informed that following incidents at a meet in February and complaints to the police, the Huntsman of the Cotswold Vale Farmers Foxhounds has pleaded guilty to racially abusing a hunt sab, fined £100 and ordered to pay £200 compensation to his victim. As Alan Morgan’s offence was, apparently, fully captured on video, a guilty plea was probably wise. He becomes the 296th individual connected with an organised Hunt in the UK who POWA records show as having received a criminal conviction or caution in the last 20 years, and the 39th official Huntsman to receive such legal sanctions. POWA Person says: Sabs have made numerous reports, and complaints to police, of assaults by servants and/or supporters of this Hunt. I believe the racial abuse incident was at the same meet, on 26-2-11, when they made allegations of a mob-handed and prolonged attack on several sabs, resulting in some injuries, and which they claimed was both instigated, and participated in, by Mr. Morgan. The full text of the sabs’ report can be read here. Since then, in March police arrived in force at the Hunt’s behest, arrested several sabs for, the activists say, no good reason and then red-facedly had to drop the charges. In October a CVFFH hound was killed by a lorry when the pack ran out on to an A road, with hunters and sabs blaming one another. A week later, monitors filmed the Hunt all over another road for several minutes, causing traffic chaos. Pictured right, A CVFFH hunter berates sabs in that calm and polite way they have. The horse seems resigned to listening to it yet again.